Medical Malpractice Insurance is Not Enough – Medical JusticeStuck by a Needle. Your Patient Refuses Consent for HIV Testing. We recently blogged about a healthcare worker who was on the receiving end of a needlestick injury. The source patient agreed to be tested for HIV and hepatitis B and C. While the initial HIV test was positive, repeat testing was negative. Great news. The healthcare worker had been placed on post-exposure prophylaxis and it was discontinued once the all-clear signal was received. Most patients are cooperative and will give affirmative consent to test their blood. What happens if the patients refuses consent? Is the healthcare worker out of luck? Do they just need to assume the patient may be HIV positive and take post-exposure prophylaxis if clinically indicated (assuming the benefit of medication outweighs the risk). Well, actually the healthcare worker has options. 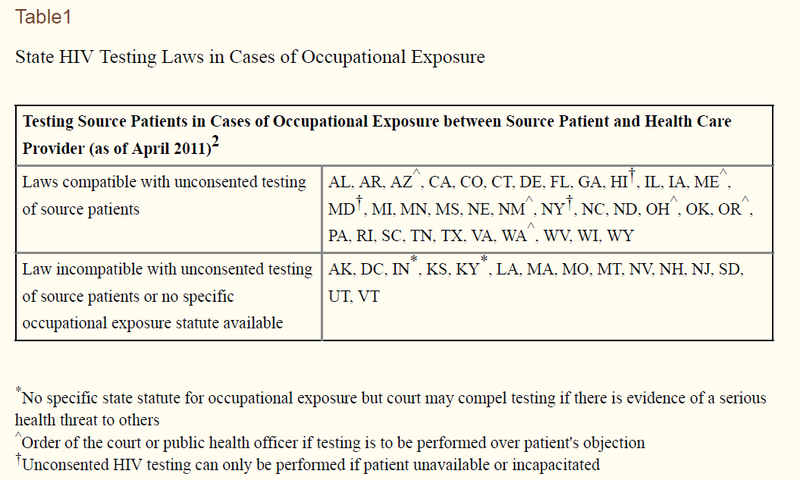 In a 2012 article, Unconsented HIV Testing in Cases of Occupational Exposure: Ethics, Law, and Policy, the authors noted that 36 states (see 2012 list from that article below) have laws that allow unconsented HIV testing of source patients in select cases of occupational exposure when such exposure occurs to healthcare workers in hospital setting. These laws vary by state. And the list is likely different today than it was in 2012. As of 2012, Arizona, Maine, New Mexico, and Oregon required a court order for all instances of unconsented HIV testing for occupational exposure. Most other states only required court order if blood specimen was not available for testing (the court order mainly being used to obtain the actual blood specimen itself). Hawaii, Maryland, and New York permitted unconsented HIV testing in cases of occupational exposure only is source patients were unable to consent because they were absent, deceased, comatose, or lacked capacity to consent. California, Rhode Island, and South Carolina permitted unconsented HIV testing on patients with full capacity even when they refuse voluntary testing. In contrast, the federal government (overseeing care of VA patients) requires a patient’s verbal consent. Q: If a source patient refuses testing, can I just test them anyway? Q: Other hospitals in my area do not require source patient consent for HIV testing during an occupational exposure. Why does VA? What is a patient refuses? One blogger who writes about North Carolina healthcare law gave practical information about how this can be addressed in North Carolina. What if a known source person refuses to be tested? The rules state that a source person may be tested with or without consent, so long as the test can be done with safety to the source person and the health care provider. In practice, providers should proceed with care if a source person refuses. A provider may try to persuade a source person to have the test, but should not restrain the person and force it. Instead, a source person who refuses testing should be reported to the local health director, who has legal authority to obtain information from other sources. The health director also has authority to enforce the communicable disease rules by instituting an action for injunctive relief in superior court (G.S. 130A-18) or seeking a misdemeanor charge against a person who refuses to comply with the rules (G.S. 130A-25; 130A-144(f)). The take home point is that in many states there are options to identify whether or not a source patient is HIV positive in cases involving occupational exposure to a healthcare worker. This can help with guidance in use and timing of potential post-exposure prophylaxis. But, caution is in order. Every state is different. And the laws change over time. If you are stuck with such a needle, consider reaching out to the CDC (for medical guidance) and your local health department (for legal options) to come up with a plan for next steps. If the HIV status is unknown as in needle cannot be traced to a specific patient e.g., needle left in bedding, or patient refuses to have HIV test done then prophylaxis is offered to you and ideally started within 4 hrs of exposure. Don’t know about Harvoni prophylaxis but in 1993 was not an option. Two more cents – Is there a single case of HIV-disease transmitted to a surgeon after a lumen-free needle stick? Is it Kosher to order HIV, and HepC titers on all patients BEFORE undergoing elective surgery, and refuse to perform surgery if the patient refuses?